Put an LCD screen, IR receiver, and buttons on top of your Pi. The maker movement just keeps getting stronger, and open hardware and software are right in the middle, combining electronics, code, construction kits, and bits and pieces of whatever’s in the spare parts bin to create something new or remake something old. 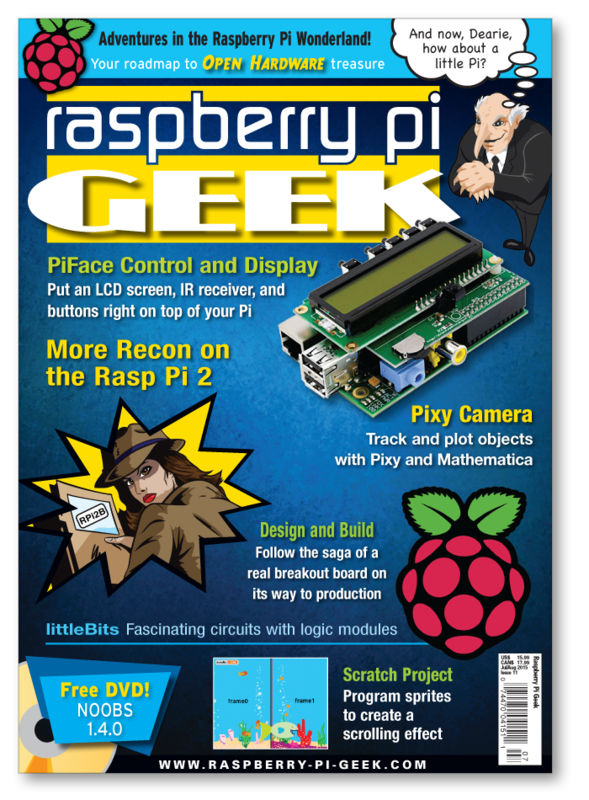 Check out this issue of Raspberry Pi Geek to see what’s new and find cool projects, tips, and tricks. The Raspberry Pi 2 looks just like its predecessor, the Rasp Pi 1 B+, and has lots of similarities; however, the freshly hatched second generation is much faster. The PiFace Control and Display unit lets you operate your Pi without a monitor or keyboard. Anonymebox lets you surf the Internet anonymously from any computer or mobile device without installing Tor software. Comparing the new Raspberry Pi 2 with the Odroid-C1. Using the PCF8583 as a clock component on the Raspberry Pi I2C bus. An uninterruptible power supply for the Raspberry Pi. A Python interface to a largeformat pen plotter. The Firefox Sync Server lets users keep bookmarks, open tabs, and saved passwords synchronized across several browsers. Designing and building your own board. Track objects with the Pixy camera and Mathematica.